First biofuels, then electrical cars and now e-fuels? A review article in the Biofuels Digest describes this option as 'biofuels beyond corn', or as others would call it: 'biofuels skipping the biomass phase'. Present processes use fast growing crops like sugarcane with about 1% SE (Solar Energy captured) and convert the biomass into liquid biofuels. Alternatively we could reach out for about 20% SE if we can convert CO2 to liquid 'solar' fuels directly in a photovoltaic route instead. Converting solar energy and CO2 directly into a useful product is very similar to photosynthesis whereby CO2 and water are converted into sugars and other building blocks. Hence this approach is sometimes referred to as: 'Artificial Photosynthesis'. Bill Gates was quoted as stating that artificial photosynthesis ('The process that uses sunlight to produce hydrogen, oxygen, and carbon.') has the potential he calls magical: “If we can improve the efficiency of this process, we may produce ample clean fuel for the vehicles of tomorrow." Smart Energy Integration (optimal use of minimize waste heat). The 'Artificial Photosynthesis' - or in more technical terms, 'Power-to-Fuels' - option has various advantages compared not only to biomass-based biofuels but also compared to battery powered electrical vehicles. As Bill Gates stated: “If it works it would be magical, because with liquids you don't have the intermittency problem of batteries. You can put the liquid into a tank and burn it whenever you want." It is worth noting that the Life Cycle Analysis (LCA) for the CO2-footprint of cars driving on e-fuels (liquid fuels produced via Power-to-Fuels) using existing internal combustion engines (ICE) is at least as good as for Battery Electrical Vehicles (BEV). The table shows in summary the total emitted CO2 of a car (tons CO2 over 220.000 km lifetime). These numbers do not yet reveal the full story. We are still missing a full life cycle analysis (LCA) for the various options, including for instance the environmental impact of battery disposal and/or recycling. At present, the conversion efficiency of power (electricity) to fuel energy content is about 50%, so considerable energy is still lost in the conversion. On the other hand, the difficulties and costs of changing to a general adoption of battery electrical vehicles with its required charging infrastructure and its inefficiencies are also substantial. It has been claimed that at least double the electrical power capacity will be required in order to be able to charge all battery electrical vehicles. Also the recycling of batteries and its LCA effects remains an issue. A great advantage of the e-fuel (e-gasoline, e-methanol, e-gas, etc.) option is that it can be applied into the existing fuels infrastructure and gradually introduced. This enables a faster transition to zero carbon emissions, while still making use of the benefits of high density hydrocarbons. Further improvements, can be made by combining e-fuels such as methanol with fuel cell's to drive fuel cell based electrical vehicles (FCEV) and thereby also replacing battery electrical vehicles. (See also 'Why will the dominant alternative transportation fuels be liquid fuels, not electricity or hydrogen' by B. Zhao in Energy Policy Vol108, September 2017, Pages 712-714). ANTECY (www.antecy.com), has been working on this route since 2010 and has come to the conclusion that it is technically and economically feasible, making use of electrolysis to produce hydrogen with renewable energy and to convert the hydrogen produced with clean and concentrated CO2 to methanol or any other (preferably) liquid hydrocarbons. This route becomes economically feasible when the cost of renewable electricity drops to less than $0.04/kWh. The cost of electricity generated from renewable sources like Solar and Wind is already getting close and in some areas heading to below $0.03/kWh. The technology to do so is in fact already available and t state-of-the art except for the step to economically harvest CO2 (and water) directly from the air. 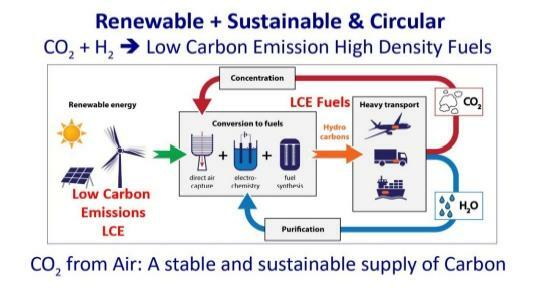 Direct Air Capture (DAC) of CO2 will be necessary when no secure CO2 point sources are present or will be present in the future at the locations where the lowest cost electricity (to produce hydrogen) is available. Furthermore it may be prudent not to rely too much on CO2 point sources of fossil origin to produce zero carbon emissions fuels. To address this ANTECY has developed and is improving and scaling up an environmentally friendly and economically viable technology to capture and concentrate CO2 from air, making it suitable for the production of Zero carbon emission fuels and chemicals. The existing technologies to separate CO2 from other gases are based on liquid or solid amines, which are sensitive to degradation particularly in the presence of oxygen. Degradation results in higher (consumption) costs while certain degradation products are toxic or even carcinogenic, leading to health and safety issues. 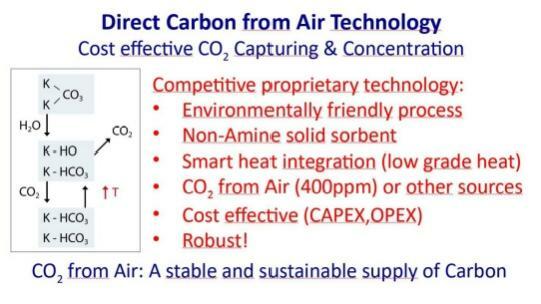 ANTECY's DAC technology, called CAIR: 'Carbon from Air', makes use of a sorbent system based on a supported solid potassium carbonate, which has no emissions, a high stability and poses no environmental risks from potentially toxic degradation. Furthermore desorption of CO2 from the sorbent can be performed at temperatures below 100 °C, enabling the use of low value heat for this purpose. This means that the overall energy efficiency of the process can be significantly improved by smart energy integration: using waste heat produced during the water splitting reaction by electrolysis and/or during the condensation of the liquid product produced by the fuel synthesis step for the desorption of CO2. Essential for the large-scale deployment of Power-to-Fuel is the industrial success of a viable cost effective CO2 Direct Air Capture technology. At ANTECY we are focused on that and are convinced that we can make it work. We have recently been awarded a ±2 Million Euro financial grant from the European Fund for Regional development Oost Nederland (EFRO) for the further improvement; development and demonstration of the CO2 capture technology. ANTECY is leading this project in a consortium with Wageningen University & Research (WUR) center and Bronswerk Heat Transfer. Shell Global solutions, is also supporting this project. In the field of scale-up and commercialization, we are cooperating with specific potential customers with as goal a first semi-commercial industrial demonstration of ANTECY's CAIR technology.